Locals have raised traffic concerns after plans for 400 rented and affordable homes in an Aberdeenshire town were launched. A planning application in principle has been lodged by Turriff-based Sandlaw Farming for the development at Braehead, Auchattie, in the south end of Banchory. The plans are for 300 rented homes, 75 affordable homes and 25 assisted living apartments, ranging from one bedroom flats to five-bedroom homes. Along with rented homes, the proposed development includes assisted living and live-work units and plans for a Banchory Medical Centre. As of last night, the proposals had attracted 33 objections from local residents concerned about the traffic impact on the South Deeside Road and the Bridge Street traffic lights in the town. However, spokesman for Sandlaw Farming, Colin Liddell, last night said the development would answer the needs of locals looking for affordable homes in the town. 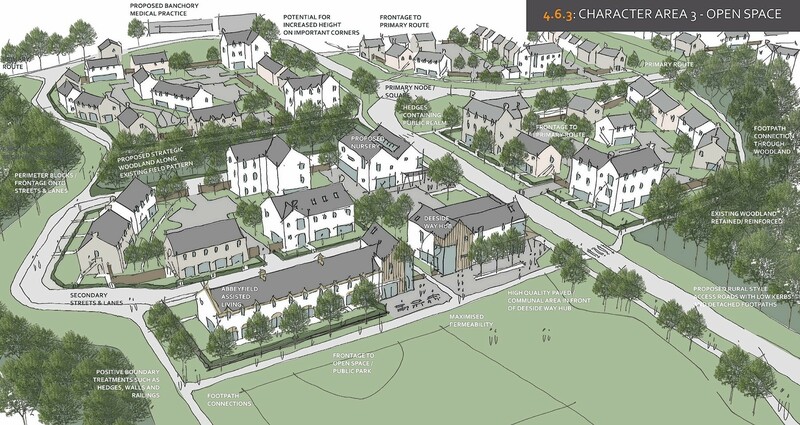 The plans were originally for more than 700 homes, but were scaled down following the consultation. Mr Liddell added: “The basic concept was a much bigger development when we did all of the consultations. there’s a huge demand in Banchory for types of housing you just can’t get at the moment. “A lot of people are finding it very difficult. The rental market is very difficult there. We reduced the scale of the development and we also changed the nature of it so it’s only housing for rent, private rented houses and homes for assisted living. “There’s a huge demand for that. This is on the River Dee, the site is only 500m (1,640ft) for the town centre compared to the previous development. Sandlaw Farming has suggested signalising the Bridge of Feugh, while South Deeside Road would be realigned around the site, with the Deeside Way extended and cycle paths created. There are also plans for a central hub for the popular Deeside Way walking path, a nursery, allotments, an adventure playground and a “sculpture trail” through the community..
Mr Liddell added: “This is a development where it is about putting people before land, people who can’t get houses. We feel very passionately about it.